VIDEO: Raptors vs. Cavaliers Game 5 Full Highlights - 2016 NBA Eastern Conference Finals - Balita Boss! The Cleveland Cavaliers cruised to a 116-78 win over the Toronto Raptors in Game 5 of 2016 NBA Eastern Conference Finals, taking a 3-2 series lead. The Cavaliers dominated every aspect of the game to put the Raptors on the brink of elimination. 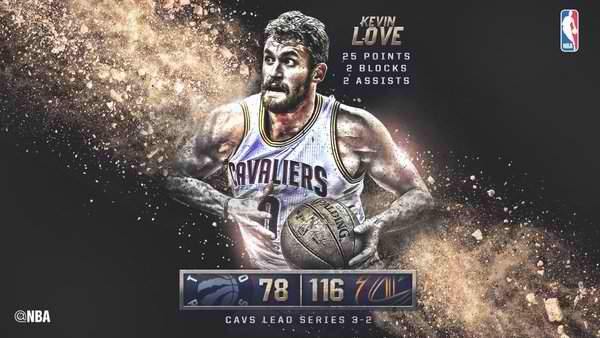 After having just 13 points on 5-of-23 shooting in Games 3 and 4 combined, Kevin Love came out firing and exploded with 25 points on 8-of-10 shooting in only 24 minutes. LeBron James and Kyrie Irving both had 23 for Cleveland. The Raptors were unable to get DeMar DeRozan and Kyle Lowry going at all after the Cavs played them far more aggressively in pick-and-roll scenarios. DeMar DeRozan finished with 14 points, Kyle Lowry scored 13 points for Toroto. They were a combined 7-of-20 from the field after combining for 119 points in Games 3 and 4. Bismack Biyombo had just four rebounds after getting 40 the past two games. Raptors will return to Toronto for Game 6.